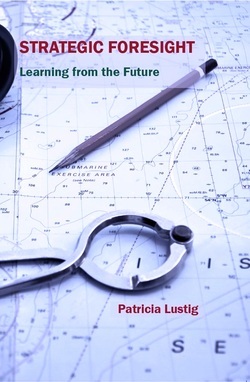 New bookSTRATEGIC FORESIGHT - Learning from the Future by Patricia Lustig (Publisher Triarchy Press) is written for leaders in any organisation. Strategic Foresight offers a set of skills and tools used to explore potential futures, so that you can plan for and take advantage of them. The book first explores ambiguity and uncertainty, introduces preferred thinking styles, outlines models, tools and maps that people will find useful for developing their own Strategic Foresight, and helps readers spot emerging trends. Finally, it describes a practical method for exploring potential futures for your organisation. Case studies are interspersed throughout the book along with exercises to encourage readers to 'think along' with the ideas.